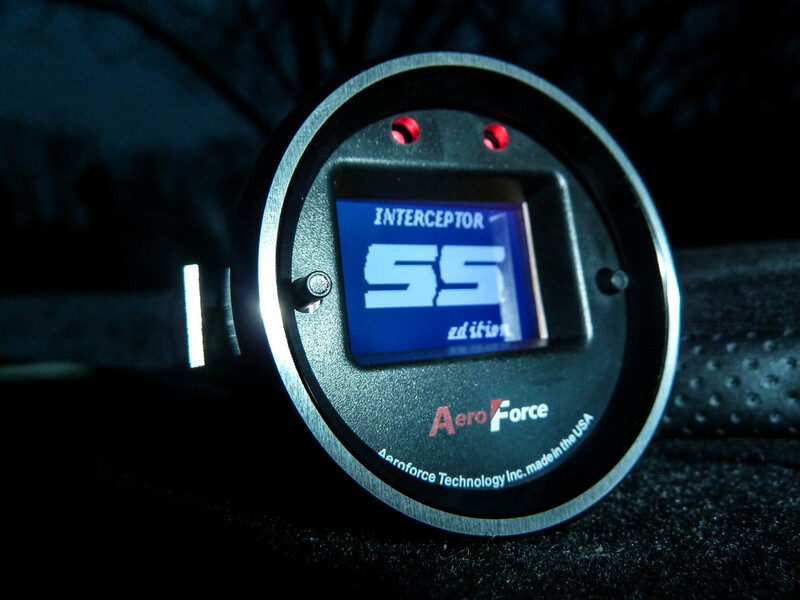 In our holiday gift guide, we picked the Aeroforce Interceptor as being a great gift idea. Like we did with the Valentine One, we thought it would be a great idea to run the Interceptor gauge through a series of tests and see how good it actually is. The president of Aeroforce, which is based in Ohio, was very kind and gave us a great opportunity to take the Interceptor for a test drive in a few different vehicles. The Aeroforce Interceptor gauge is a standard 2 1/16" gauge that will fit most gauge pods and openings. One would purchase this gauge for a number of reasons, mainly being you want more information about your vehicle. The gauge comes in a neatly packaged box that includes a couple different cords, basic instructions, and obviously the gauge. Our tester gauge arrived with a black face and the black/white display color. Also included was an additional gauge face that was white. Aeroforce offers these faces with your vehicles logo on them, like SVT, Abarth, or even TRD. This will give your gauge an almost stock like appearance in your vehicle for a small additional cost. The kit also included a little bracket and finger screws which help the install process. Depending on your install location, vehicle setup, and anything else this will all vary. They have included everything though for most standard installs, you just need to provide the spot where it installs and route the wires. Gauge pods are very popular for this, mounted on the pillar, center dash, or even on the steering column. Be careful placing them in HVAC vents though, as Aeroforce says excessive heat can cause some issues with your gauge. For our test, we decided not to fully install the Interceptor. The plan was to see how the gauge worked in a few different vehicles and then go from there. Basically, we just plugged the gauge into the OBD port under the dash and then started the vehicle. The cord included is about 5' long, which gave us plenty of room to snake it around for our test. The instructions give a pretty standard startup time for the gauge, our vehicles took about five seconds before the lights and Aeroforce logos appeared. A neat little trick with this gauge is you can remove one of the stock logos and put on your own, like the "SS" you see below. This is one of the many settings which you can setup and customize. We chose to just pick as many parameters as possible, then see what shows up and what is useful. Keep in mind, this gauge has the white/black screen. Our photos came out sort of blue, but the screen is actually a black with white font. This can be inverted as well, where the font turns black and the background is a bright white. 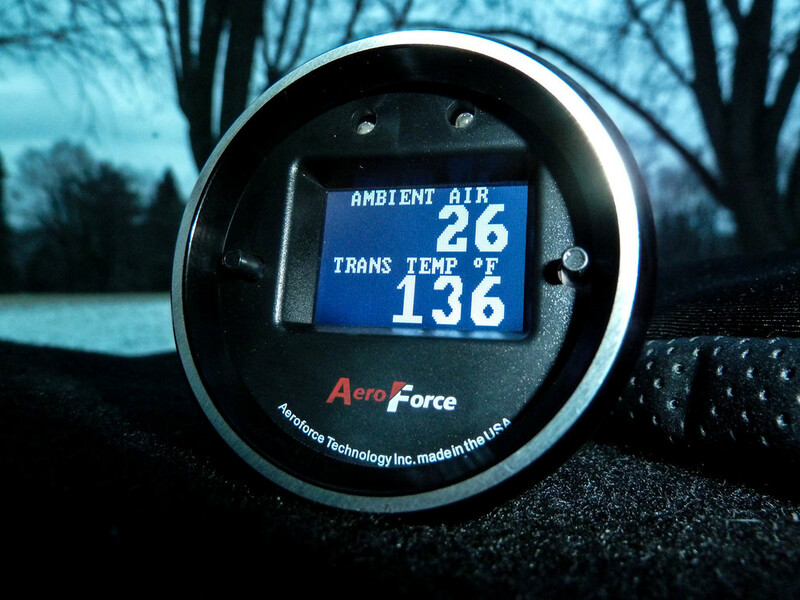 Aeroforce offers the screen in a variety of colors as well, including red, blue, and green. The others can compliment whatever your interior colors may be or if you get all trick with LEDs all over. When looking at all this gauge has to offer, I was overwhelmed. The amount of parameters and readouts was insane. You really can monitor almost everything just from plugging this into the OBD port. What is interesting is most of the features are being read by your on board computer already. The interceptor allows you to tap into that and actually see what is going on. Things like oil temperature, transmission temperature, throttle volts, spark advance, MPG, and many others are available. You can get the full list from Aeroforce Technology, which has a very detailed website. The temperature displays were what interested me, when you consider that the stock engine temperature gauges anymore are really just dummy gauges. They show hot, cold, and overheating - that's about all. The interceptor allowed me to see exactly what the temperature was for the engine, engine oil, transmission, and also has an input in case I want to put a sensor into anything else on the car. Taking all of the parameters you want to monitor, you then setup your interceptor to actually scan through them automatically. You are able to pick what it shows, how long it shows it, and what part of the gauge shows the readout. This keeps your hands on the wheel and also keeps you informed about what your vehicle is doing at all times. We setup a few different ones just to see how it worked, but the ability to fine tune this is really exciting for somebody who really wants to know exactly what is going on with their car. Another neat feature which you setup to your specs are the warning lights. Say for example you are towing a large trailer or driving aggressive at the track. The interceptor can be setup to alert you when your transmission temperature reaches dangerous levels. The red LED lights will turn on, letting you know to stop and let everything cool down. That is an amazing feature which can be programmed to almost any parameter the gauge reads, and whatever level you feel is dangerous or damaging. Overall, we feel the Aeroforce Interceptor is a win. If you can get around the fact that you are buying a very expensive gauge, and realize the capabilities it has, you will find this to be your new best friend that rides in the car with you. The amount of items it will readout, setting up the alerts, fixing check engine lights, and also having some fun with the 0-60 times - the Interceptor is something you will not get sick of. I have yet to drive with one for an extended amount of time, but in all honesty feel kind of alone without it because I liked knowing what was going on with my car. This is not a product that you will be able to justify to everyone out there. The Interceptor is made for people who need more from their car. If you were on the fence, considering one, or just looking for reassurance from us - go for it. 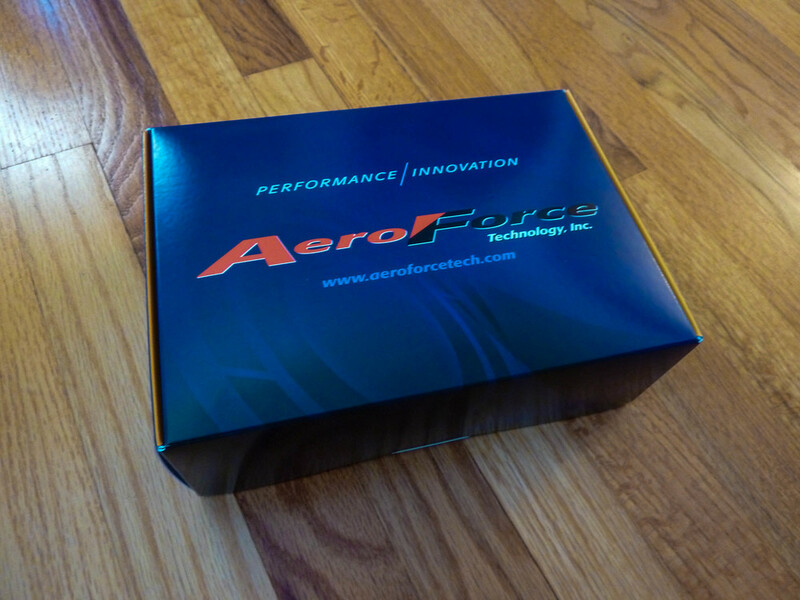 For more information and to purchase, visit Aeroforce Technology Inc.
Parameters! - The Interceptor will read out everything and then some. Still amazed at how much info is crammed into such a tiny package. Size - Speaking of being tiny, you can install this in so many different places without looking like you are from the first Fast and Furious movie. Everything Else - DTC Readout, Warning Lights, Customized Gauge Faces, and Made in the USA! Company based out of Ohio - Just like Hoagies Garage. Cost - This is a single gauge that costs over $200. Tinkering - The Interceptor takes some setting up to get perfect. If you are old school and not tech savvy, this could keep you from enjoying it until you get it all dialed in.